So I realized far too late on Thursday that I never ended up posting the weekly Yanaguana HQ update. I've got a little something extra for this Tuesday update to make up for that. Basically what happened last week is we were all busy getting things ready for a submission to PAX South's Tabletop Indie Showcase. Marshall was busy getting updated artwork done and assembling a print and play version of the game, while I was busy editing together a video overview of the game and writing up a questionnaire for our print and play test volunteers. There wasn't really anything to update other than we were doing those things that caused me to miss the post. I figured I would mention that the chosen games for that Hasbro contest we entered, are now live on Indiegogo. It was an interesting mix that were chosen, and based on the finalists, I can't really figure out what Hasbro was going for, though the games do look fun. If you visit this link, you'll be able to see all five of them and visit their Indiegogo campaigns from there. Now onto what I'm sure you're waiting for, another reveal of cards in Shipload o'Gold! In coming up with what were the initial nine Actions in Shipload o'Gold, we wanted to be able to cancel out the effects of certain things. At first, with the initial set of Actions, having the "cancel" cards equal in number to the cards they cancelled seemed too strong. Then we tried having one less "cancel" card than the Action it was meant to cancel. That ended up never really having the interaction we wanted. It was around this time in development that we decided on cards having different sell values (originally Actions would all be sold for one coin). Rather than having us, the designers, set a "difficulty" to cancel an Action due to the lower number of cancel cards, we decided to give those cancel cards the highest sell values. 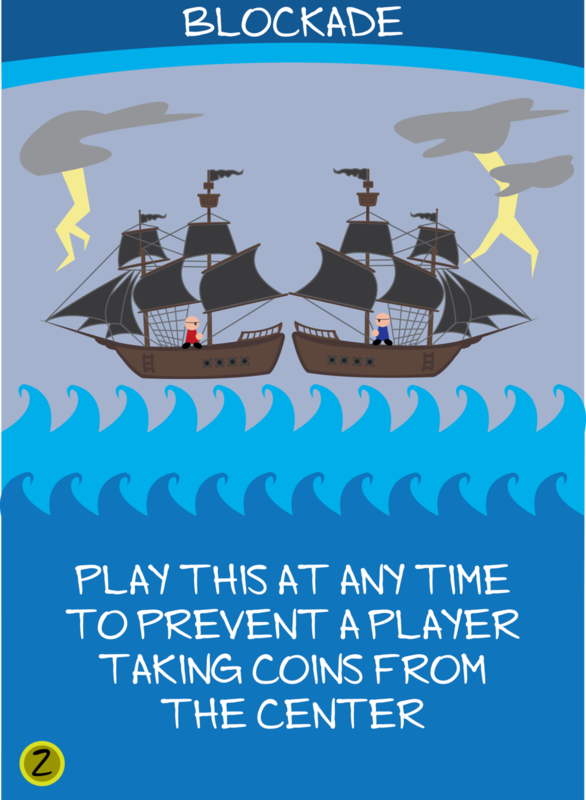 This way, the choice would rest with the player if they wanted to use the card to cancel an Action, or if they wanted to sell it and increase the odds that an Action wouldn't get cancelled. This ended up making for some interesting moments in play testing where people would get hit by a certain Action just after they sold the cancel card for it. It also added the potential for some political aspects to the game. The way we word the cancel cards means that they can be used even when the Action they cancel is used on someone else. Granted, the majority of the time it's really only beneficial to use when you're getting hit with a card, but we have seen players ask us if they're able to use it to help someone else. It's an extra level to the game that we didn't intend to create, but will be exploring in the future. Outrun and Loyal Crew were two of the original nine actions (even though Mutiny evolved quite a bit, there was always Loyal Crew to cancel it). Blockade was one of the more recent additions, and was added as Raid and another yet to be revealed card can create too big of a swing. Also, keep in mind that Blockade doesn't have to be used just when an Action card is played. It could also be used to keep someone from getting coins after selling an Action card. So there's your new cards for the week. Barring any other craziness, I will be back on Thursday with a Yanaguana HQ update (I don't want to run out of cards too quick! ).